Reiki is a Japanese technique for stress reduction and relaxation that also promotes healing. It's administered by "laying on hands" and is based on the idea that an unseen "life force energy" is flowing through us. 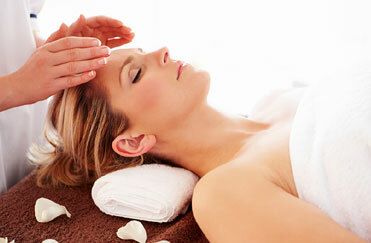 Reiki treats the whole person including body, emotions and mind. It works in conjunction with all other medication or therapeutic techniques to relief side-effects and promote recovery. Contact me if you want more information about my Reiki sessions. Reiki is a spiritual practice developed in 1922 by Japanese Buddhist Mikao Usui. The teaching was continued and adapted by various teachers. It uses a technique commonly called palm healing as a form of complementary and alternative medicine and is sometimes classified as oriental medicine by some professional bodies. Through the use of this technique, universal energy (reiki) is transferred in the form of ki through the palms that allows for self-healing and a state of equilibrium. There are two main branches of Reiki, commonly referred to as Traditional Japanese Reiki and Western Reiki. The primary difference between branches is that the Westernized form uses systematized gestures rather than relying on an intuitive sense for proper hand patterns. Both branches have a three-tiered hierarchy of degrees - commonly called First, Second, and Master/Teacher - which are associated with different skills and abilities. Please contact me if you want to know more about Reiki or if you want to book a session.